A Speaker's Guidebook 6 Edition A Speaker's Guidebook is the best resource for public speaking in the classroom, on the job, and in the community. Praised for connecting with students who use it (and keep it!) 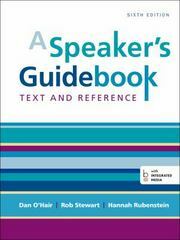 year after year, this tabbed, comb-bound text covers all the topics typically taught in the introductory course and is the easiest-to-use public speaking text available. In every edition, including this one, hundreds of instructors have helped the book focus on overcoming the fundamental challenges of the public speaking classroom. Print and digital tools converge in this edition to help students with every aspect of the speech building process. A new, gorgeous collection of speech videos, accompanied by questions, model speech techniques. Meanwhile, the adaptive quizzing program, LearningCurve, creates a personalized learning experience adjusted to each individual.A Speaker's Guidebook is also available in a variety of digital formats, including the brand-new, time-saving LaunchPad edition that combines an interactive e-book, integrated videos and tools, and ready-made assessment options curated into easy-to-assign units inside one convenient learning program.